The dreaded question of, “What’s for dinner?” is the last thing you want to answer after a busy day of work, chores and family activities. Yet, with planning and the following meal prep tips, it is possible to know exactly what’s for dinner each night of the week—a home cooked, healthy meal you and your family will appreciate. Preparing for a week of breakfasts, lunches, dinners and snacks is a mighty task, so it’s important to do your homework before heading to the store. Examine your week’s schedule and identify exactly what meals you need to prep for, advises EatThis.com writer Olivia Tarantino. Greatist.com’s Talia Koren creates a grid to keep her meal prep schedule organized. Column one records meals (breakfast, snacks, lunch and dinner) and the weekdays she’s prepping for top the rest of the columns. Koren fills in her chart with ingredients that fulfill food groups—protein, produce and carbohydrates—rather than complete recipes because that allows her more meal inspiration as well as the balance she craves. If you prefer to focus on complete recipes in your meal prep, Tarantino suggests choosing ones that incorporate the same ingredients as well as recipes you can multiply. Once you’ve completed your meal prep chart, it’s time to figure out exactly what and how much you need to buy. 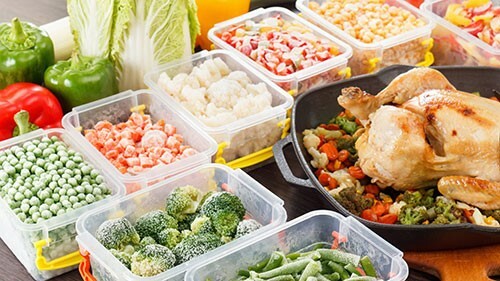 While you’re at the store buying ingredients, consider purchasing some good quality food containers to protect your meal prep efforts. Tarantino also recommends buying in bulk, especially if you are preparing for an entire week’s worth of meals, as a smart way of keeping your food budget in balance. On your designated meal prep day (it doesn’t have to be the same day you go to the grocery store), wash and chop your fruits and veggies, storing them in separate containers. Whip up a large amount of grains and pan roast your vegetables, advises TheFresh20.com Writer Melissa Lanz. Tarantino suggests prepping eggs, chicken, black beans or your preferred proteins for the week as well. With these meal prep tips, you can say goodbye to the dreaded question of what to have for dinner every night.